Update: Well, that was fast! While servers weren't scheduled to come back online until 11am Pacific / 7pm BST, Bungie Help has just tweeted that maintenance is done and players can resume their alien-killing activities. That's about an hour and 45 minutes earlier than expected! But hey, I ain't complaining. Original story: Hope you weren't planning to take the day off and play some Destiny 2 - the servers are currently down for scheduled maintenance. Said maintenance began at 7am Pacific / 3pm BST, with all players being removed from activities an hour later. The servers are currently scheduled to return at 11am Pacific / 7pm BST. That said, don't be surprised if things take a little longer than planned. Last week, maintenance ended up lasting five hours longer than expected, leaving plenty of players unhappy. Hopefully whatever kinks caused the delay have been ironed out and we can cross our fingers for a speedier return to blasting aliens and looking good while doing it. After maintenance is complete, players will be able to download update 1.0.1.3. 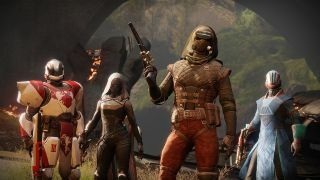 Bungie hasn't released detailed patch notes on what exactly this version will change, but it said last week that at least part of the update will remove imagery that has come to be associated with white supremacist groups. The gauntlets said imagery is attached to will not be taken out of the game though, so you're not going to lose loot you've already acquired. Other than that, I wouldn't expect anything world-changing. Update 1.0.1.2 fixed several issues, including one bug that caused Clan Rosters to not be displayed, a memory leak that could sometimes cause the game to crash, and an issue with players receiving the MIDA Mini-Tool when they had a full inventory. To follow along with maintenance updates, keep an eye on the Bungie Help Twitter account. And once the game is back online, make sure your fireteam all have the new version installed or you'll get error code SHEEP when trying to do a group activity, meaning somebody is running an outdated version.